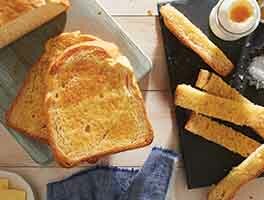 This delicious, fine-grained loaf is perfect for sandwiches and toast — including French toast and melba toast. Combine all of the ingredients, and mix and knead — using your hands, a mixer, or a bread machine set on the dough cycle — to form a smooth, soft dough. Transfer the dough to a lightly greased bowl or dough-rising bucket, cover the bowl or bucket, and allow the dough to rise until puffy though not necessarily doubled in bulk, about 1 1/2 hours, depending on the warmth of your kitchen. Lightly grease a 13" pain de mie pan. Gently deflate the dough, transfer it to a lightly greased work surface, shape it into a 13" log, and fit it into the pan. Cover the pan with lightly greased plastic wrap, and allow the dough to rise until it's just below the lip of the pan, 45 minutes to 1 hour, depending on the warmth of your kitchen (it may rise even more slowly in a cool kitchen; don't worry, this long rise will give it great flavor). Remove the plastic, and place the cover on the pan. Bake the bread for 25 minutes. Remove the pan from the oven, carefully remove the lid, and return the bread to the oven to bake for an additional 20 minutes, or until it tests done; a digital thermometer inserted into the center will register 190°F. 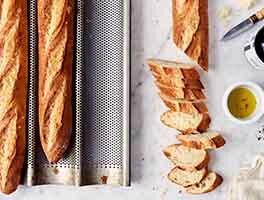 Remove the bread from the oven, and turn it out of the pan onto a rack to cool completely. Store, wrapped, at room temperature for 4 days, or freeze for up to 3 months. It came out beautiful, soft and bouncy. If I used 2 smaller Pullman pans- 8.35 x 4, would I have to make any adjustments, both in the amount of dough and the baking time? Thank you! Hello! I have made this twice and have trouble with the dough rising. The first time it did not rise at all. Today I tried again. It rose beautifully the first time but after I deflated it and put it into the pan it did not rise at all. How can this be? Another question, if it rose so well on the first rise, why not just put it into the pan immediately after mixing and bake it without doing a second rise? I bought a Pain de Mie in 13X4X4 to make this recipe. We love it. There are only 2 of us. I bought a good Lock n Lock bread keeper and we keep the bread in the refrigerator. My question is, will it stay fresh if we slice the whole loaf before storing in the bread keeper or should we continue slicing as we need it? A loaf has lasted about a week. It took me a few tries to get it right but this bread is delicious. 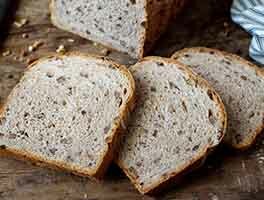 It is a staple for me as a sandwich loaf but is also perfect as an accompaniment to meals, especially with butter. Perfect! Just got my pain de Pie pan yesterday and couldn't wait to try it. And I did and so glad I did. A wonderful sandwich loaf. Followed the directions exactly and there were no issues at all. Once again KAF-Thanks. I've tried this recipe twice and can not figure out where I went wrong. Used new flour, new yeast, good temperature water, was very accurate on measurements and both batches were dry and did not rise half of what they should. I guess my one question would be that under dry milk choices one option is for 1/4 cup of one product or for 1/2 cup nonfat dry milk powder and if you choose the 1/2 cup do you need to adjust for the higher amount of dry ingredient added? Bc if so that needs to be stated. I am sure the recipe is fine, but I had a problem. Bread didn't quite rise enough. Sides and too were not square. Very soft and crumbly. Tastes good though. What did I do wrong ? Steve, extra flour often hinders dough from rising. It would also produce a more crumbly texture. This has to be the best sandwich loaf I have ever tasted. Honestly, as soft as the softest wonder bread, but with a buttery flavor that is just outstanding. 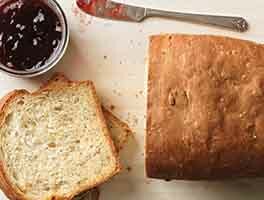 I have made it 4 times now and it has become my go to for simple sandwich bread. My only word of advise is really watch the 2nd rise on a warm day, it can be only a few minutes between perfect and "hard to get the top on". I made this for the first time the other day and it turned out perfectly. My husband loves it toasted. 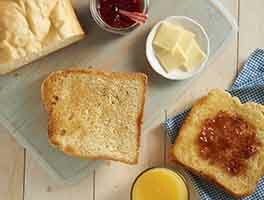 I'm curious if there would be any disadvantage to using bread flour instead of all-purpose, and whether it would be a problem adding 1-2 eggs to the recipe (reducing the water to compensate for the added liquid).